Music Machine Entertainment has been around since 1972. Founded by Normand Demers, it has been a well known name in New England for many years. Jason Demers took the company over in 2005 changing the style to match today weddings taste. Jason Demers has been setting the standard in private event entertainment since 2005. Trusted by the most discerning clients, Jason adds a dynamic dimension to the marquee private event industry that is matched by very few. Blurring the lines between nightlife and private event entertainment, Jason is in a constant state of evolution. He continually looks to push the creative bar higher by utilizing a vast universe of experience unbound by the traditional limitations of genres, race, or normal. With world class production elements, inimitable style, seamless mixing abilities, and a polished microphone presence, Jason has established a brand known for excellence, professionalism, and most of all- consistent results of awesome. Jason is CO-owner of Rhode Island Weddings and Events, which is a group that allows bride the experience of a one stop shop. From photography, Photo-booths, and officiants services you can find it here. Having worked with Music Machine Entertainment team for over 5 years at different events, Chris has become a very popular host for events all over New England. Chris’ professionalism and musical talent has been cultured throughout the past 5 years in many different places within the entertainment industry. 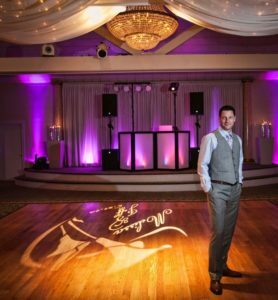 So, whether you’re celebrating a special birthday, dancing your first dance as husband and wife, lighting your 16th candle, or rolling out the red carpet – Chris is a talented Music Machine Event Host and DJ that is sure to compliment your upcoming celebration. Smooth style with a smile and energy to keep your family and friends on the dance floor all night long makes Chris an awesome option for your upcoming affair with the entertainment experts at the our Group. As a DJ and MC for over 16 years, John is a creative force who has touched so many facets of the industry. His taste for music developed very early on, from high-school and on through college. John has had the opportunity to play music for crowds as diverse as ice cream flavors! Playing countless private parties, bars and nightclub venues throughout his career. John has earned the reputation of being a meticulous music mixer. Over the years, John has never shied away from the microphone, connecting with the crowd on all levels. There aren’t many in the private event entertainment circle who have mastery over both the music and the microphone. The combination of a professional-yet- relaxed-and- natural mic presence, plus exceptional music mixing and programming are the perfect combination for a successful event. He approaches every event with complete professionalism, while at the same time, making the crowd feel comfortable enough to let loose. On the microphone he is energetic, over the top and exciting – it is all about being passionate and Scott is just that. He loves being an Event Host and helping people celebrate the best times of their lives. As a performer, Scott loves to stay on the heartbeat of the newest industry trends, and will work directly with his clients to build one of a kind celebrations that are personal and something to be remembered for a lifetime. Scott knows his music. Music has been a major part of his life since he was a kid and he is well versed in everything from the 1940’s to the current radio hits of today. Want to have some fun? If you are looking for a one of a kind, high energy, unforgettable, over the top celebration, then Scott is a perfect fit for you. Dave brings a production twist to the our team of diverse talent options. With over 5 years of experience as a DJ, Dave has become a valuable part of our company. He has evolved into a creative visionary in the private event industry through years of hard work and technical training. He has been a key team member of some of our largest and most complex production events. From smashing dance floors with flawless and creative mixing ability to incorporating unique technology options to create some awesome for his events – Dave is becoming an incredible resource for people looking for talent that is focused on music and production that is not intrusive. Billy has been with our company the longest. With over 30 years in the industry and with our group, he bring many years of knowledge. Billy is the Master of the Ceremonies with his award winning voice. He can make your introductions one to remember. Billy believes that the role of a DJ is more then just playing music. Courtesy, attention to detail, and proper planning are the keys to a successful event.